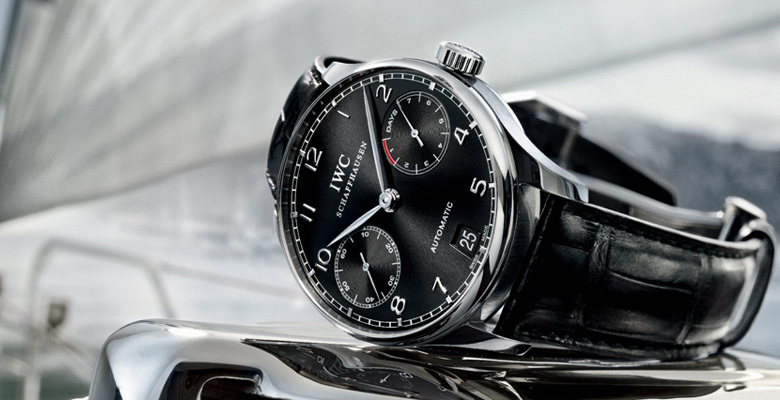 The IWC Portuguese: a model whose inception is attributed to two Portuguese merchants. While in the 1930s, Portugal is no longer a major world power and its role on the world’s seas is no longer dominant, but in the veins of the Portuguese still flows the blood of the great masters of the oceans, Fernão de Magalhães – better known as Magellan – to name the most famous. 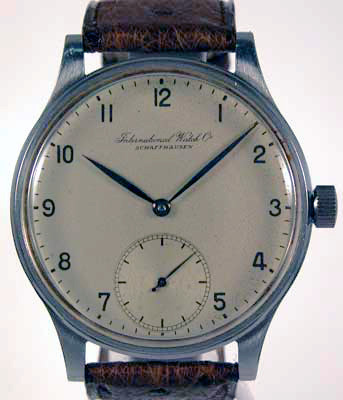 It was in the in 1930’s that the idea for the IWC Portuguese was formed when two Portuguese business men called Rodrigues and Teixeira knocked at the door of Schaffhausen manufactory and asked them to build a wristwatch with the same qualities as a marine chronometer – high precision and excellent readability. 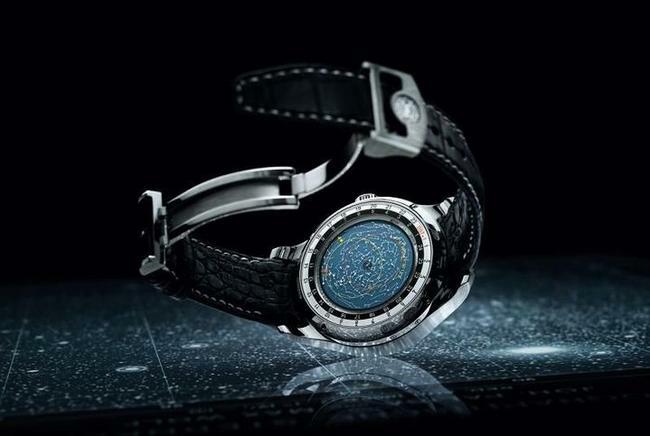 At that time the only way IWC could fulfill this request was by using a pocket watch as the base. So the master watchmakers of IWC took caliber 74, with its movement mounted on a bridge and diverted it from its original purpose to become a wristwatch. In 1939 the resulting wristwatch (reference 325) with a diameter case of 43 mm, the first Portuguese at the time, was completely contrary to the current style that was small – around 10mm smaller – watches in an Art Deco style. It was also the first wristwatch to use a pocket watch movement and the ancestor of todays larger diameter watches. The key design elements of the Portuguese were a streamlined dial with Arabic numbers, a very thin bezel contributing to make the watch look even larger, leaf (“feuilles de sauge”) hands and a large sub dial at six o’clock for the seconds. The Portuguese design had an uncompromising elegance and generous dimensions, it featured a slender bezel, leaf hands and large seconds sub-dial at 6 o’clock. During the 1940s and the 1950s, most of the Portuguese produced used the Calibre 98 which had evolved out of the original Calibre 74. The Portuguese was still being produced in the 70’s and 80’s using Calibre 982 which featured shock protection. By the 1990’s though the Portuguese appeared to be in decline and it was only a lucky coincidence that saw its revival. A customer who visited the brand during this time was wearing the original reference 325 Portuguese and according to Kurt Klaus pioneer of many of the most important complications at IWC it was declared that “this is such a uniquely beautiful watch; we should make it again”. So the Portuguese returned to the front of the stage in 1993 with a special series celebrating the 125th anniversary of the factory: The Portuguese ref. 5441. There was a total of 1750 of this reference produced: 1000 in stainless steel, 500 in rose gold and 250 in platinum. Since then, the range has been extended with many models (chrono’s, tourbillon, perpetual calendar, etc) All having in common the uncompromising design codes of the original model. 1995 saw the release of the first Minute Repeater Portuguese ref. 5240 in a limited edition of 555 with 250 in rose gold and 250 in yellow gold and 50 in platinum. Introduced in 1996 was the Portuguese Chronograph Rattrapante ref.3712 followed with ref 3714 an automatic chronograph version which went on to become IWC’s most successful watch ever. As part of the IWC Vintage Collection in 2008 IWC introduced a Portuguese Hand-Wound model which was very reminiscent of the original 1939 model except for the state of the art technical aspects. Then in 2010 released for the first time ever in a Portuguese case was a Grande Complication. This was a technical tour de force featuring a minute repeater, chronograph and the most difficult of complications a perpetual calendar that was programmed up until 2499. The 45mm case was available in red gold or platinum and with a feature that recalled the origins of the first Portuguese which was an engraving of a sextant on the back cover, a representation of marine navigation. Most recently in 2011 IWC released after 10 years of development the Portuguese Sidérale Scafusia which is “the most exclusive and complicated mechanical watch ever made by IWC.” From its humble beginnings it must have been hard to imagine the watch that started out as a modification of a pocket watch would ascend to such technical heights. Introduced in 1939, today the IWC Portuguese is not only IWC’s the most popular but also the most identifiable IWC watch. More resources about the IWC Portuguese available on Hodinkee, and Official IWC Website.